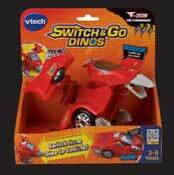 Get ready to embark on a "dino-mite" adventure with the Switch & Go Dinos by VTech. 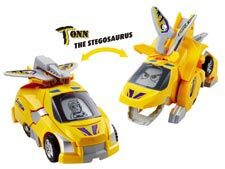 Boys ages 3 through 8 will love playing with Tonn, a bright yellow Stegosaurus who likes to drive in style. Each Dino can be switched from dinosaur to vehicle and back again in just a few easy steps. Listen to Tonn's many sounds and phrases with the press of a button. You can even choose how Tonn's eyes will look in dino mode and who the driver will be in vehicle mode. Whatever form he's in, Tonn is ready to rock and roll to adventure. Limited 1-year warranty against defects in material and workmanship. 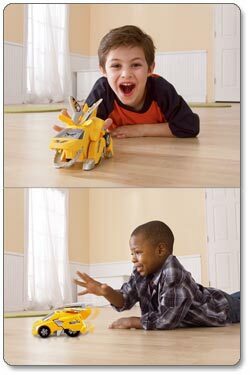 Children can easily switch Tonn from a fierce stegosaurus into a speedy-looking race car. View larger. Tonn makes stomping sounds in dino-mode, and racing sounds in vehicle-mode. View larger. Say hello to Tonn the bright yellow Stegosaurus. They call him Tonn because his friends think he's tons of fun. 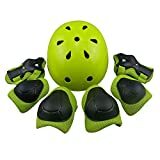 His body is covered in spiky, triangle-shaped plates so he is always ready to rock and roll. When he's not out chomping on leaves, Tonn turns into a super-cool car. 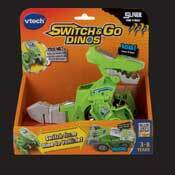 This Switch & Go Dino is ready to play--just try to keep up! 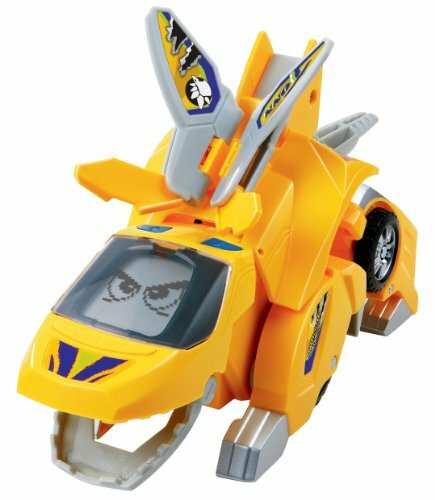 Children ages 3 through 8 will enjoy playing with Tonn in both dino and vehicle mode. In a few easy steps, boys can switch Tonn from a fierce Stegosaurus into a speedy-looking race car. Press one of the two buttons to hear Tonn make awesome stomping sounds when he's in dino mode, or racing sounds when he's in vehicle mode. Press the second button to hear him talk, and Tonn will tell you all about his wild life as a Stegosaurus. With more than 50 unique sounds and phrases, Tonn will keep you guessing at what he will say next. Tonn sports a couple personalized designs with his name on them, and can turn the gray plates on his back into spoilers for his car. By pressing the style button in dino mode, children can choose which pair of dinosaur eyes Tonn will show on his LCD screen. You can also choose Tonn's driver when he's in vehicle mode by pressing the same button. This product is backed by a manufacturer's limited one-year warranty against defects in material and workmanship. 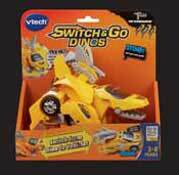 VTech Switch & Go Dinos - Tonn the Stegosaurus, 2 AAA batteries, and instruction booklet. 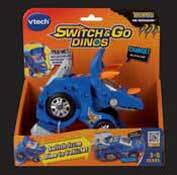 Horns the Triceratops™, Tonn the Stegosaurus™, T-Don the Pteranodon™, and Sliver the T-Rex™ are all trademarks of VTech. VTech is a registered trademark of VTech.